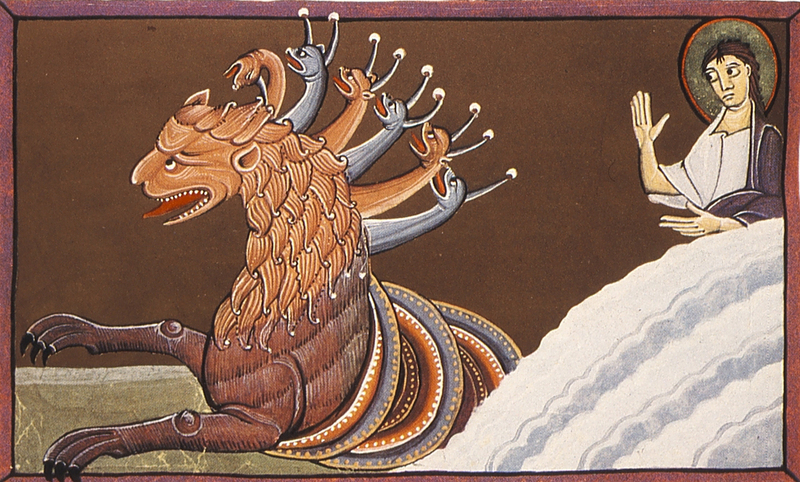 The primary illustration is The Beast from the Sea with Seven Heads, from Folio 32, the Bamberg Apocalypse (early 11th Century), with the beast coming out of the surf (lower right). Other illustrations includes a 9th C. gold and enamel figure of St. Michael from the Basilica of St. Mark, Venice; tge 6th C. Christ Pantrokrator icon, St. Catherine’s Monastery, Sinai; and an icon of Jeremiah. The account relies heavily upon back-references to the Old Testament, two numerological references, and continues St. John’s “world turned upside down” parody of the Beast-ascendant instead of the Lord God Almighty (Pantokrator). I also completed and uploaded a Podcast Homily for the Eleventh Sunday After Trinity. The Scripture readings are 1 Corinthians 15:1-11 and Luke 18:9-14. Since I think it unwise to consider the Parable of the Pharisee and the Tax Collector without presenting it in the context of the Parable of the Tenacious Widow, I included Luke 18:1-8 and a quotation from Jeremiah on what God expects of His people, which is what both parables are about. Listen to the Podcast for Trinity 11. Thanks once again for those of you who continue to support the AIC’s online ministry. Donations in any amount are always welcome, payable to the Anglican Internet Church and sent to 7162 Soft Wind Lane, Mechanicsville, VA 23111. You can also support the AIC through the purchase of any of our books through my Amazon Author page. You can see the list of all nine publications there. May God bless you in all that you do in His Name. Amen!